Beach tent is a prominent stuff to carry along for an extended recreation at the beach. 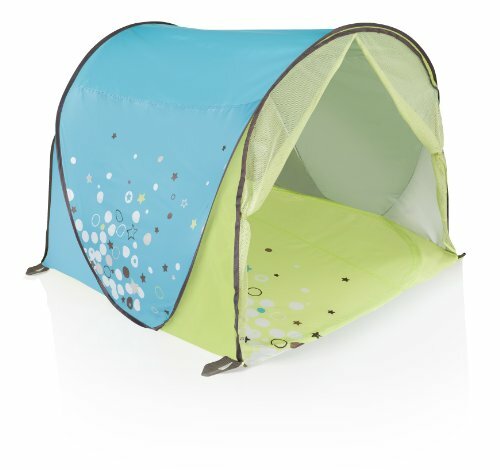 Especially if you have a toddler, then a baby beach tent is a must have accessory. 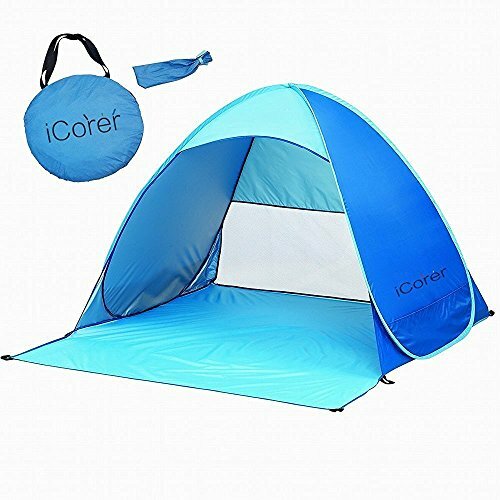 These tents are similar to other standard tents and shower tent, but particularly designed for children by keeping in mind all liabilities. 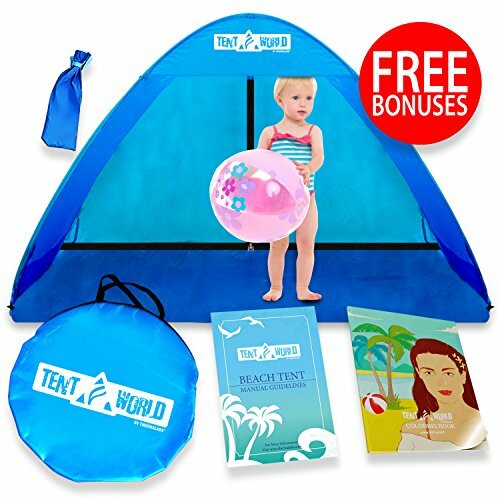 A toddler beach tent acts as a sunshade and provides a special shady spot for your young one to play and relax. It protects your baby from over exposure to sun and heat. Other than beach, you can also use baby tents at your backyard for your kids to play around. If you are not willing to buy a baby beach shelter, then you can also make a temporary shade by DIY. However, the baby sun shelter not only will make things a lot easier for you, but also offer your bundle of joy a good, safe and fun time at the beach. Do you need a beach tent only for your baby or for your family? 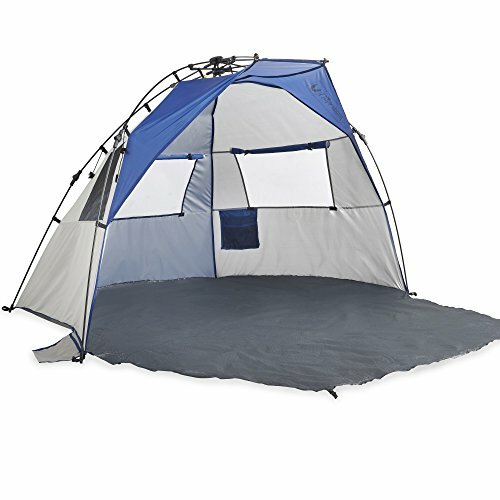 Will the tent give protection from UV rays or only provide shade? 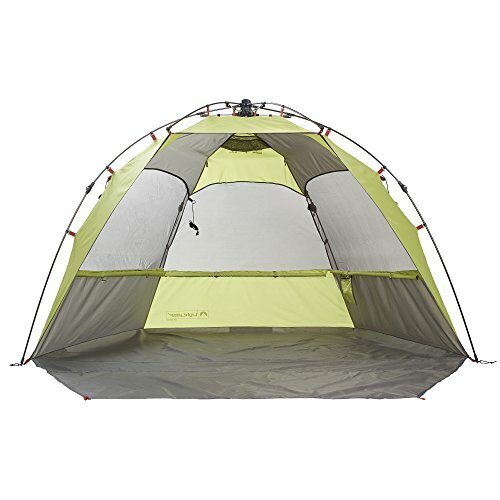 Does the tent have proper ventilation or will it heat up like oven? 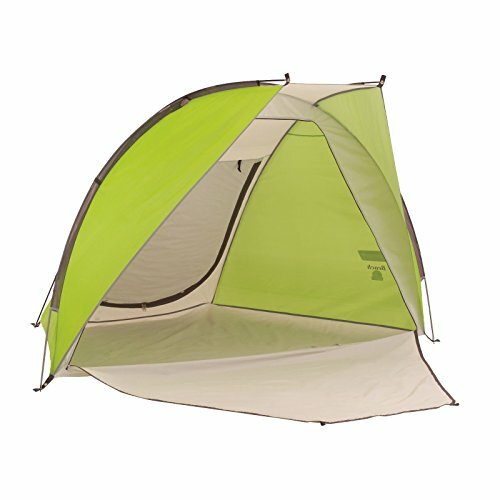 Are there other features in the tent such as stakes and sand pockets to maintain its stability? How old is your child? And how many children you have? 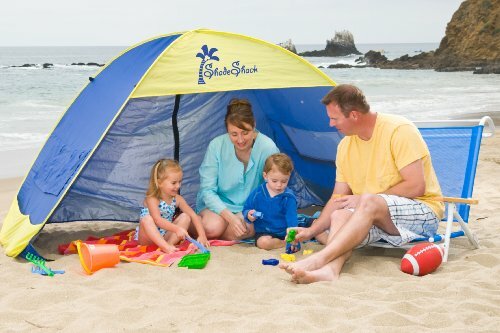 Also, in case you are purchasing a family beach tent, how many members are there in your family? How much effort and time you can commit for setting up the tent? What is your child’s comfort zone? Which style will best suit your need? 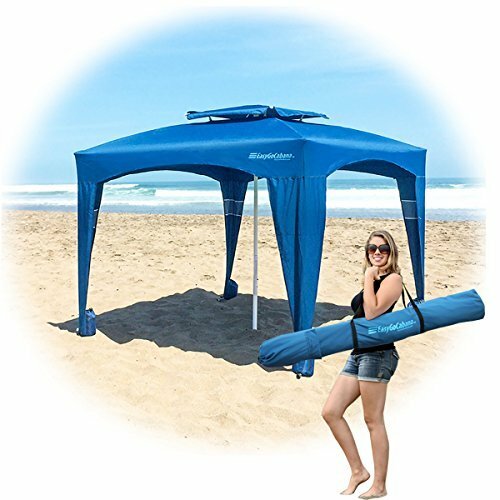 If you appreciate owning a family beach tent, and want to purchase an extra large and high capacity tent that can accommodate a huge family whenever you go on a beach outing, then Lightspeed Outdoors Quick Cabana is a valuable sun-shelter made of breathable polyester with water resistant coating. Weighing only 7 pounds, this cabana model is profoundly light, and consists of an innovative UPF 50+ coating that protects the users from the harmful ultra violet rays. 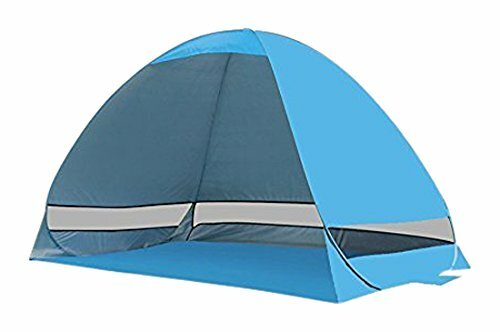 For convenient use, easy storage, and added stability, this bright grey and blue family beach tent comes with rugged foldable fiberglass poles. It measures 96 inches by 54.5 inches by 49.25 inches, and has 3 large mesh windows for maximum ventilation. With kid and dog durable polyester oxford used as flooring fabric, this tent is sure to last very long. Choose this Lightspeed cabana model if you are highly concerned about space, visibility and ventilation. The one feature of this beach tent that calls out from several meters away is its classic design. Not many models come with a design as good as this. 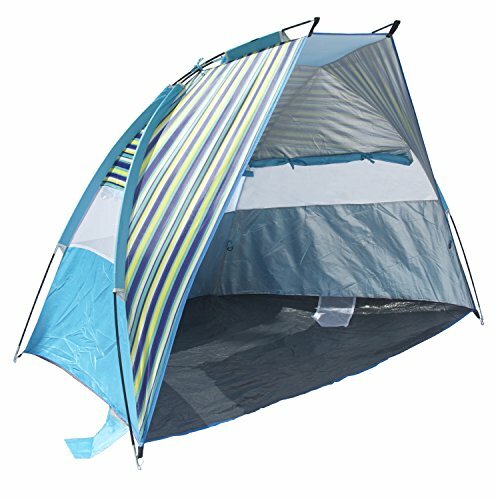 Measuring 95 inches by 51 inches by 52 inches, this Pacific Breeze model is an attractive and affordable beach tent perfect for a family of 4. This easy up cabana is made from water resistant breathable polyester with UPF 50+ coating that provides optimal UV protection, and its waterproof PE floor will keep the users dry. Weight of only 6 pounds makes it portable and easy to carry. Easy up feature allows the user to set the tent effortlessly in minutes. However, the poles are made of fiberglass, so it may have a weigh benefit, but if too much pressure is applied during setup or when you take it down, they may snap and break. 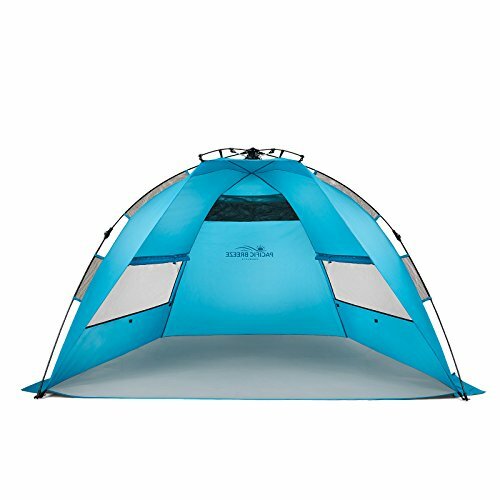 Irrespective of some of its limitations, this deluxe tent is one of the best selling beach tents. Most of the time older kids love to play on the sand, and many like to spend time making sandcastles out of it. For this purpose Demco incorporated has created this special shade shack children’s beach tent so that your kids can play safely on the beach. 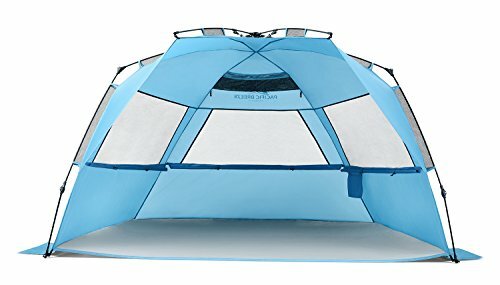 The yellow and blue tent comes with an easy to set up pop-up design that approximately measures 90 inches by 53 inches by 51 inches. Its one-piece construction and weight of only 7.2 pounds make it relatively portable and easy to store. It has three side walls that provide protection and shade. The side windows can be opened and rolled up for privacy. The tent may be light but it will stay securely planted with the easy to fill sand pockets. Not the highest around, but it has UPF 30+ coating that will keep your kids protected up to some extent. This top popup beach tent is huge enough to comfortably fit a family of 4. If you have fixed a good budget in your mind, and looking forward to purchase the classiest and most innovative beach tent then this 2 in 1 cabana style tent by WildHorn is the ultimate choice for you. 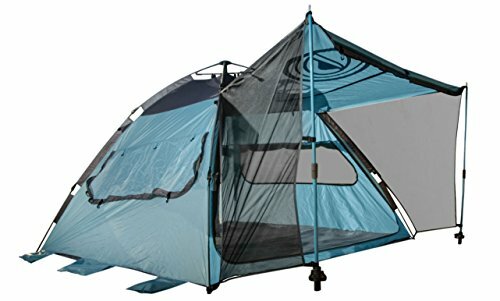 This unique tent is probably the most versatile and convenient beach tent you will ever own. With around 4 ft 8 inches height and 56 sq ft living area, it has enough space for your need and can fit 4 adults comfortably. Its canvas is made from water repellent 210T polyester and has 300 D oxford flooring, making it rugged and durable. You can just relax and enjoy the cool breeze at the beach as the tent has automatic frame that sets up in seconds effortlessly. Also, this tent is multifunctional, allowing you to use it in many different ways. Tent for beach looks more suitable when it’s in the shape of an umbrella. As its name suggests, the Sports-Brella sun umbrella is an extra large and equally attractive beach tent that measures approximately 54 inches by 3.5 inches by 3.5 inches that can fit 2 adults. 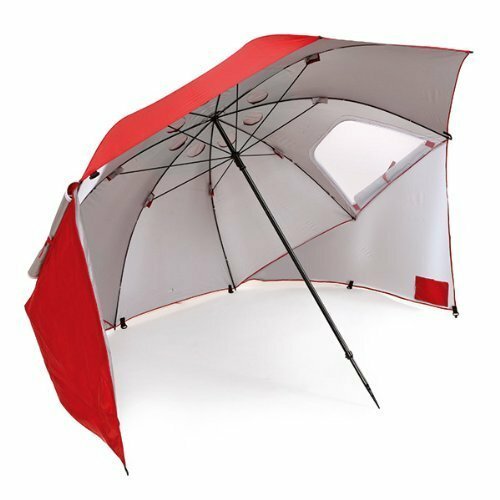 This sun umbrella has a striking red theme, and easy-to easy to install design. Rugged 210 D polyester is used to make this durable beach tent that offers complete protection against all weather elements. With 50+ UPF protections, the Sport-Brella sun tent excels at safeguarding your little ones, by providing over 99.5% protection against UVA and UVB rays from the sun. If you are looking for a high quality professional beach tent, but that can also give an optimum protection to your little toddler, then Coleman DayTripper Beach Shade can be a very good choice for you. This UV tent for beach is coated with SPF 50+ coating and can provide ultimate protection against UVA and UVB rays, so you don’t have to worry about your child being at risk of the harmful effects. Measuring about 89 by 53 by 57 inches, it features enough space for 2 adults. Most importantly, its kid proof flooring will protect your toddler from sand. 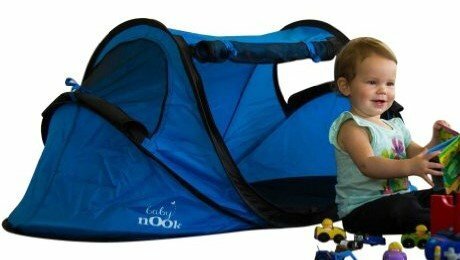 Baby Nook Travel Bed and beach tent is an excellent choice if you are looking for a high quality tent suitable for your toddler. 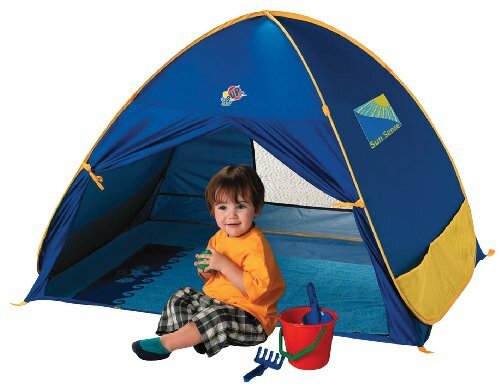 This infant beach tent measures around 47 inches by 24 inches by 20 inches with proper ventilation. It weighs only 3.1 pounds and is best for travel or outings. 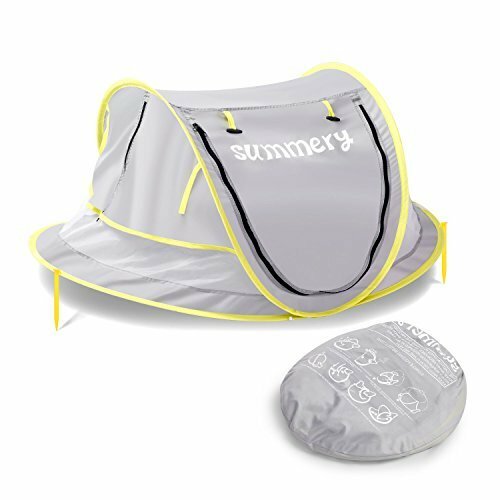 This anti-UV tent for baby includes an air baby nap mat for better comfort and stability. The inflatable pad offers a comfortable nap when your bundle of joy is sleepy. You can also check up on baby through the mesh windows of your toddler’s tent without exposing him to bugs. It’s made from breathable waterproof polyester, with UPF 50+ coating and protects your child from exposure to UV rays. This popup Baby Nook tent might be a little more expensive than other options, but it seems to be a perfect choice for beach outings. Most high quality tents are made of polyurethane or polyester fabric as these materials are not only light, but also weather resistant up to some extent. The type of fabric used is a vital aspect to consider as the atmosphere inside the tent totally depends on the material used. Generally beach tents for children come with UPF protection. In this the fabric has a coating that prevents the harmful Ultra violet rays of the sun from penetrating the tent’s material and harming your bundle of joy. The highest portion of tent is mostly coated as it’s more exposed. However, tents with no coating on the sides will allow better ventilation and comfort. The fabric must also be very rugged and of top quality, as you are going to invest a good amount of money. Good quality fabric and frame will ensure better lasting in the long run. If you are not an expert at setting up items that need good hand coordination then you may know the difficulties you could face when you have to set up a tent manually. You can’t just take a risk of messing up your baby’s tent. To avoid such messy situation, it’s highly recommended to pick an infant beach tent that can easily be installed and taken down. 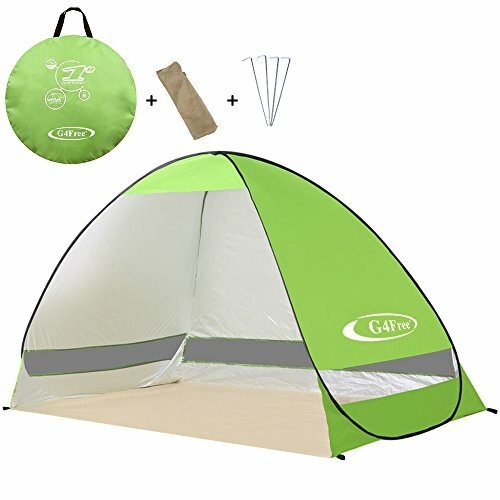 There are some tents that can be set up in seconds. Choosing this type of tent will also save you a lot of time and let you concentrate more on having fun. Buying an accurate size is very important. The tent is not necessary just to place your baby in, but it must also have a comfortable space for your toddler to play around. In case you are buying a family beach tent, consider the number of children and adults who are going to use the tent, if standing up in the sun shelter needs to be an option, and whether you’ll need accommodation for picnic chairs and tables. Buying unnecessarily huge tent is not a very good idea if you have a small family or if you require the beach tent only for a child. This type if tent is usually in the shape of tarpaulin, which can be transformed into a shelter in a snap. 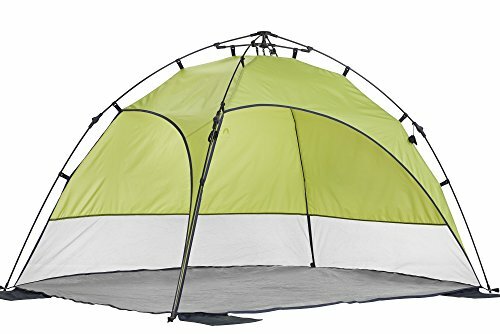 Pop-up tent is easy to set up and use. These can also be packed with least effort after a long day. These tents are very light weight to carry around and can be weighed down by sandbags to maintain stability. 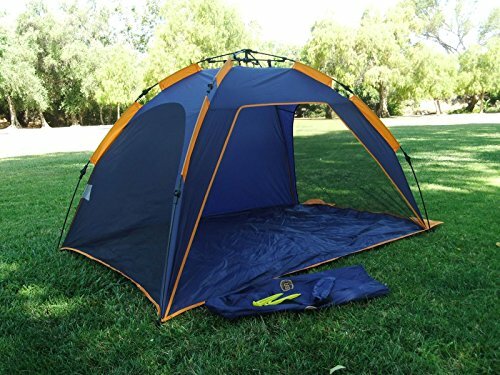 However, pop up tents can be way more expensive that other types of beach tents. Cabana tents can offer a good shade, while also offering a proper view of the ocean as they are wide open at one side. The opening of most cabana models can be zipped in case you require some privacy. These tents are highly convenient and have self-erecting feature. They come with high SPF coating and offer extra protection from sun. If you have a large family and love to enjoy some quality picnic at the beach then the huge canopy models are best for you. Generally the small ones can fit 2 to 3 adults. Canopy tents can be large enough for a party or other events. However, setting up this type of tent needs a few people and can take a lot of time. 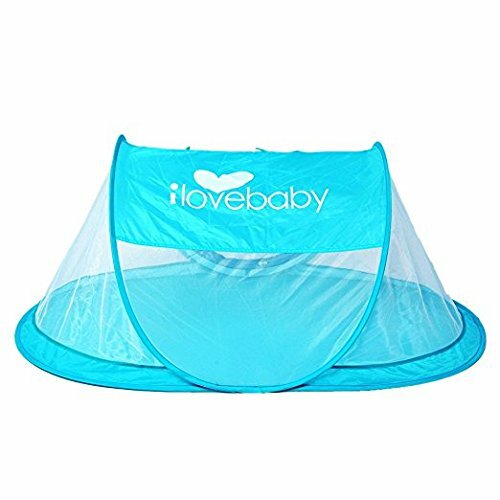 In case you have a toddler and want to protect the baby from any contact with the sand, then it’s best to go for a baby sun tent with integrated floor. 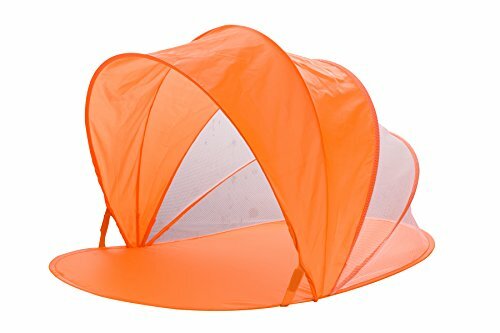 Again, if you have older children who love to build sandcastles whole day then it’s best to get a kids sun tent without floor. Beach tents come in wide range of colors and designs, so it won’t be difficult for you to find the one that suits your taste. A brightly colored tent is best for children, while some children may insist on getting a particular color, so it’s good to involve then while choosing one. When you are going for an outing, and taking your new born or toddler along, it’s obvious that you’ll have to carry other items like snacks, juice bottles, spare clothes, diapers and many more. This means that your ability to carry other things is limited. 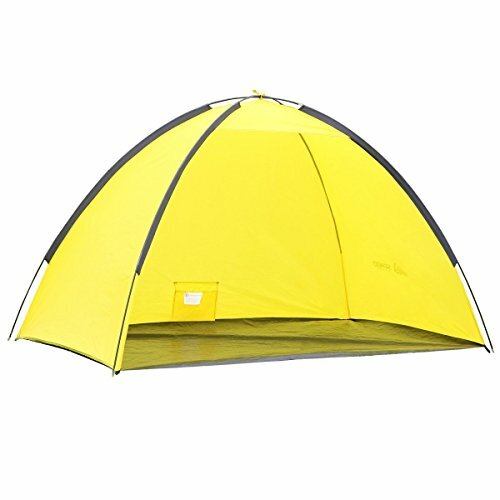 So you should pick a beach tent which is light weight and convenient to carry. However, tents that are too light can be easily blown away when the wind gets heavy. For this you should make sure that the tent comes with additional stakes or pockets so that the tent is firmly planted and its stability persists throughout. As you are going to use the beach tent outdoors, it will get dirty and with children around, stains will also be there for sure. For this the fabric of the tent must be washable, and also the dirt must be easily removable from the material. Some high quality tents come with light cloth that promotes quick dry. Before anything else, if you are buying a sun tent for baby, you must think about the safety of your little one. The design, cloth and everything must be highly comfortable for your child. Most importantly, the cloth must be breathable. Some tents are not suitable for toddlers and come with an age tag, so always confirm if a particular tent is safe for your child’s age before purchasing one. The tent must not contain any sort of extension or feature that can physically harm your baby. You can’t always keep an eye on your toddler once you start having fun, so make sure your child will be safe at least inside the tent. As there are unlimited choices available in the market of beach tents, choosing one can be a tough task. But once you know your requirements and consider all the necessary factors, you’ll realize that it’s not that difficult after all. So take your time in deciding, and purchase the beach tent that suits you. Great Beach tent list. it include lots of best beach tents.